As pavement ages, it is subject to many stresses that deteriorate its performance. Cracks are one of the most common and serious pavement problems. Cracks usually form as a result of thermal expansion, aging, and reflection of cracks from underlying layers. 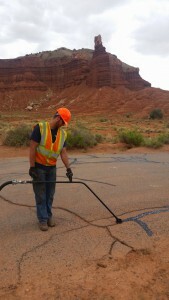 Left untreated, cracks will create serious problems that decrease the pavement’s lifespan. 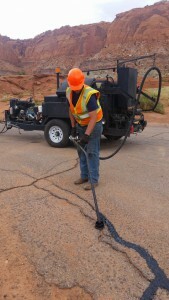 Yearly maintenance plays a significant role in the preservation of pavement infrastructure. 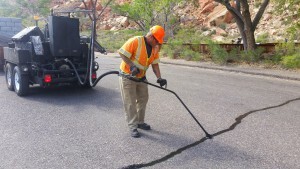 NUVO® crack sealant is designed to seal cracks and minimize the penetration of water into the base below the pavement. 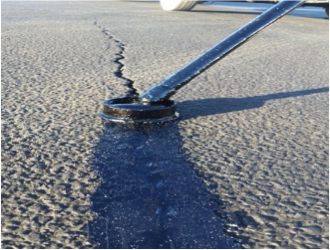 NUVO® crack sealant has been shown to be cost-effective in preventing further damage to pavement and will greatly extend pavement’s lifespan. Asphalt is prone to wear and tear from traffic and sun damage. 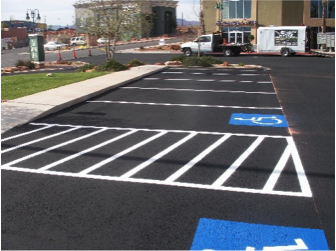 Applying seal coat to asphalt protects the structure of the asphalt from from wear and tear, as well as, sun damage. Applying seal coat to asphalt also increases curb appeal while preventing costly repairs to the asphalt. Straight Stripe Painting Inc. is the only certified applicator in Southern Utah for Nu Rock’s Onyx® premium seal coat product. Onyx® mastic surface treatment combines the durability you want from a pavement maintenance application with the environmental sensitivity you demand. Onyx® mastic surface treatment has been engineered to develop early strength, even when applied at night. Using ONYX® minimizes the often unseen cost of downtime with faster application and return to traffic. Onyx® is a central plant manufactured technology that is applied without dilution. This manufacturing method allows for increased quality control andquality assurance. Additionally, ONYX® has significantly higher loadings of unique polymers and catalysts that deliver long-term performance. Nu Coat™ is a high performance, modified asphalt emulsion designed to protect and renew asphalt pavements. The advanced system combines the richest additives with cutting-edge acrylic technology to produce an elite asphalt treatment. Nu Coat™ seals in asphalt oils and protects against ultraviolet rays, water, and motor vehicle fluids, resulting in asphalt longevity. Nu Coat™ will hold up to everyday demands because of cutting-edge acrylic technologies that increase strength and durability. Nu Coat™ also goes on thick, creating a rich coat that restores pavement to a deep black color that patrons love.